Scientists have discovered two “body clock” genes that reveal how seasonal changes in hormones are controlled and could ultimately help find treatments for seasonal affective disorder. Researchers at the Universities of Edinburgh and Manchester also found that one of these genes (EYA3) has a similar role in both birds and mammals, showing a common link that has been conserved for more than 300 million years. 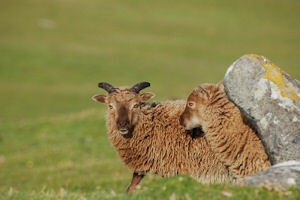 Scientists studied thousands of genes in Soay sheep. This breed, which dates back to the Bronze Age, is considered to be one of the most primitive with seasonal body clocks unaffected by cross breeding throughout the centuries. For a long time, scientists had speculated that a key molecule – termed tuberalin – was produced in the pituitary gland at the base of the brain and sent signals to release hormones involved in driving seasonal changes. However, until now scientists have had no idea about the nature of this molecule, how it works or how it is controlled. The team focussed on a part of the brain that responds to melatonin – a hormone known to be involved in seasonal timing in mammals. The study revealed a candidate molecule for the elusive tuberalin, which communicates within the pituitary gland to signal the release of another hormone – prolactin – when days start getting longer. This helps animals adapt to seasonal changes in the environment. The researchers, whose findings are published in the journal Current Biology, subsequently identified two genes – TAC1 and EYA3 – that were both activated early when natural hormone levels rise due to longer days. Professor Dave Burt, of The Roslin Institute at the University of Edinburgh, said: “For more than a decade scientists have known about the presence of this mysterious molecule tuberalin, but until now nobody has known quite how it worked. The study suggests that the first gene TAC1 could only work when the second gene EYA3 – which is also found in birds - was present. The second gene may act to regulate TAC 1 so that it could be switched on in response to increasing day length.